Held every Sunday morning during Goucher College’s Family Weekend in October. The run/walk is held in memory of Corene “Renie” Amoss who died in 1993 shortly after graduating from Goucher. Renie (Pronounced “Ree-Nee”) was a three-sport Academic All-American with a 3.7 GPA. 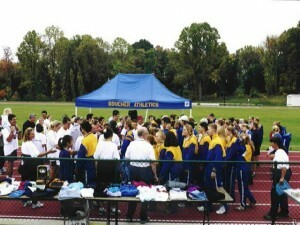 The proceeds from the Memorial Run go towards a Trust fund, The Renie Amoss Fund, which grants several monetary awards each school year to eligible Goucher College students. The run began in October 1993; is strongly supported by the College Administration; and sponsored by the Athletic Department. Sally Baum (Tennis) and fellow coaches initiated the event, and Sally continues to coordinate it each year. Some participants are serious runners and enjoy the prizes that are awarded at the post-run ceremony. While most participants just enjoy the cordial social atmosphere of the walk around the Campus, and the raffle prizes after the exercise.